Born dirt-poor (his family had the dirt floor to prove it), Waylon Jennings took all the grit of his hometown of Littlefield, Texas, into his soul and his sound. From childhood, this son of a farm laborer considered nothing else but playing music. Stubborn enough never to lose sight of his goal, dumb enough not to realize how long and hard the road, he started as a country disc jockey in Lubbock, then signed on as a protege of fellow Texan Buddy Holly, missing the plane crash that claimed Holly's life by an accident of fate. Cut in the mode of Hank Williams and Carl Smith, yet determined to infuse conservative country music traditions with the energy of rock and roll, Waylon broke the closed society of Nashville sessions in the sixties. Under the tutelage of legends like Porter Wagoner and Ernest Tubb, he shared living quarters with Johnny Cash, took songwriting tips from Roger Miller and encouragement (often unsolicited) from Willie Nelson, and hung out after hours with Kris Kristofferson and George Jones. In the wake of country's own distinctive counterculture, when southern-fried acid freaks met - and partied with - diehard good ol' boys, Waylon helped give America something genuinely new. His 1976 anthology album, Wanted: The Outlaws, was a stunning platinum success, heralding a sound and a mood that evoked the country's pioneer spirit, a restlessness always pushing at the horizon and looking toward the next ridge. But while the artist and performer devoured life and rewrote the rules of the nation's popular music, the star binged on an endless stream of cocaine and pills and staggered through three failed marriages. Ultimately - and inspiringly - Waylon triumphed over his drug habit, proving he would fight for the right to sing his song. At the same time, he ended his long search for the right woman and married Jessi Colter, a country-singing great in her own right and now Waylon's wife for more than a quarter of a century. Today, two-time Grammy winner and sixteen-time chart topper Waylon Jennings keeps the country fires raging, joining fellow superstars Willie Nelson, Johnny Cash and Kris Kristofferson on their sold-out international tours as the Highwaymen. 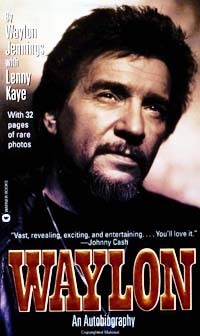 Featuring a selected discography and thirty-two pages of rare photos from the Jennings family archives, WAYLON: AN AUTOBIOGRAPHY is his no-holds barred, tell it all story, overflowing with the honesty, true humor, and down-home charisma of an authentic honky-tonk hero down to the very last page. Waylon Jennings lives with his wife, Jessi Colter, and their son, Shooter, in Nashville, Tennessee. Lenny Kaye is an acclaimed music writer whose work has appeared in Rolling Stone, Village Voice, Creem, Hit Parader, and Crawdaddy. He plays guitar with rock poet Patti Smith and serves on the nominating committee for the Rock Hall of Fame.